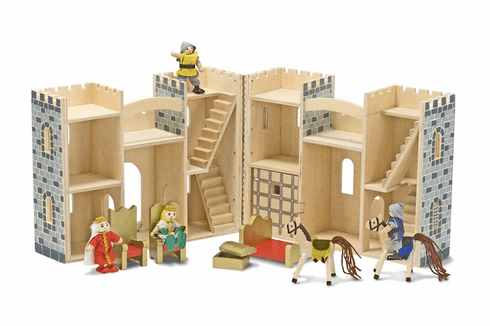 The Melissa and Doug Fold and Go Castle allows for compact and portable pretend play! This mini wooden castle opens up to reveal the inside of the kingdom. Each set includes 11 durable wood pieces. The king and queen have thrones and a royal bed, while 2 knights are ready on horseback to defend the treasure chest. A working drawbridge and a dungeon are included to add to the imaginative play! The Fold and Go Castle features a chunky wooden handle for easy transport.